Billy Whitehouse’s career in the Leeds United first team lasted only 73 minutes in a game that supporters are all too glad to forget. “Some of the younger lads spent much of pre-season with the first team, the likes of Eoghan Stokes, Alex Purver and Ronaldo Vieira (who would go on to be a regular in the first team) gained valuable experience during the summer. Leeds came through the tie, played on a Monday night with the BT Sport cameras looking for an upset. It looked likely with the League Two side taking a first half lead before Leeds fought back to triumph 2-1 and set up a fourth round tie away at Sutton United, again in front of the cameras. “I was nearing fitness as the Sutton game approached and on the Thursday, Jason (Blunt) informed me that I would be joining up with the first team. “I admit that I didn’t do myself justice in a tough game. Sutton never let us settle into the game and at the final whistle; we just wanted to get away from the place. “Garry Monk strengthened his squad in January and the arrivals of Alfonso Pedraza and Mo Barrow killed off any slim chances I had of playing in the Championship although I continued to train with the first team. “The end of the season soon came and it was clear that I wouldn’t be getting a new deal. I felt, that at almost 21 years of age, I was too old to continue playing Development League football – I needed to kick on and get some first team games under my belt which was not really going to happen at Elland Road. I had to be realistic about the situation. 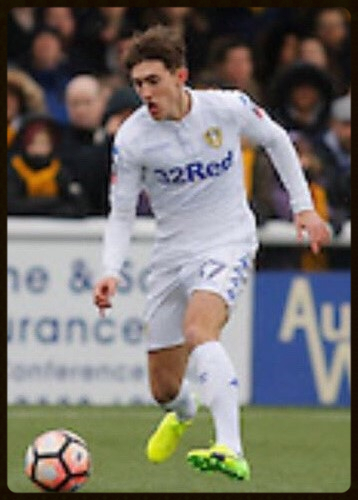 “I had helped a lot of the scholars throughout the season and the Academy management, Adam Underwood and Jason Blunt, appreciated that and although it was difficult to leave Leeds United, it was something I had to do. “Despite what happened at Sutton, I am proud to be able to say that I played for Leeds United, I had a good season and I have nothing but praise for the club and everyone involved. “It’s been a long road for the supporters since relegation from the Premier League but I sense that the tide has turned and I am sure that the club will be back in the top flight next season. Mr Radrizzani has done some brilliant things already and from speaking to some of my old team mates, especially Conor Shaughnessy, I know how well the club is being run. “I looked up to Stuart, he is a true professional and a great guy. He does the right things at the right times, works incredibly hard and strives to be the best he can. He was always offering me advice and I will always respect him for that. “Another player I admired was Kalvin Phillips, another one who works hard and remains very level-headed. He’s a true role model for the younger players. “Danny was fantastic and I enjoyed my brief time at Vale Park but from there I joined Alfreton Town on a non-contract basis but in all honesty I wanted to be playing at a higher level and hopefully soon, the right move will materialise. Thank you to Billy Whitehouse for giving me his time and the opportunity to write this article.